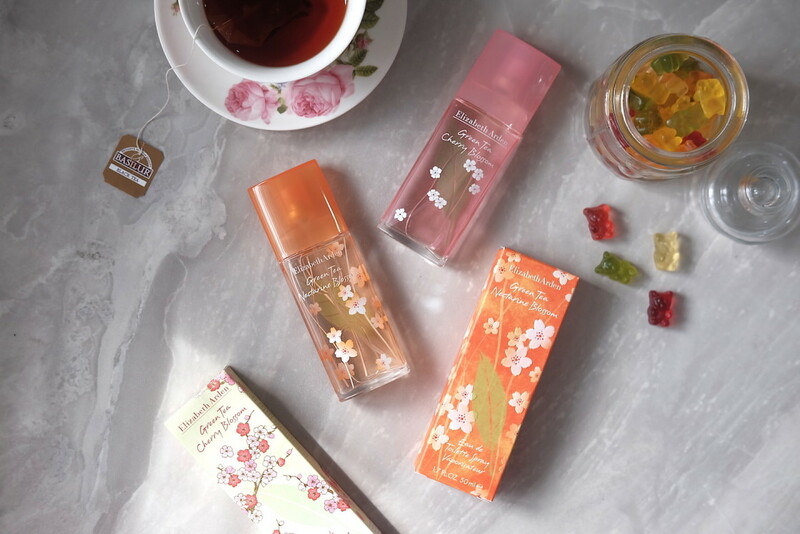 I am so thrilled to present my second blog giveaway! I’m so grateful to have been given the opportunity to collaborate with The Clink Shop for this giveaway because I’ve been going crazy over their hand made arm candies! Check out how I’ve been wearing them here and here. 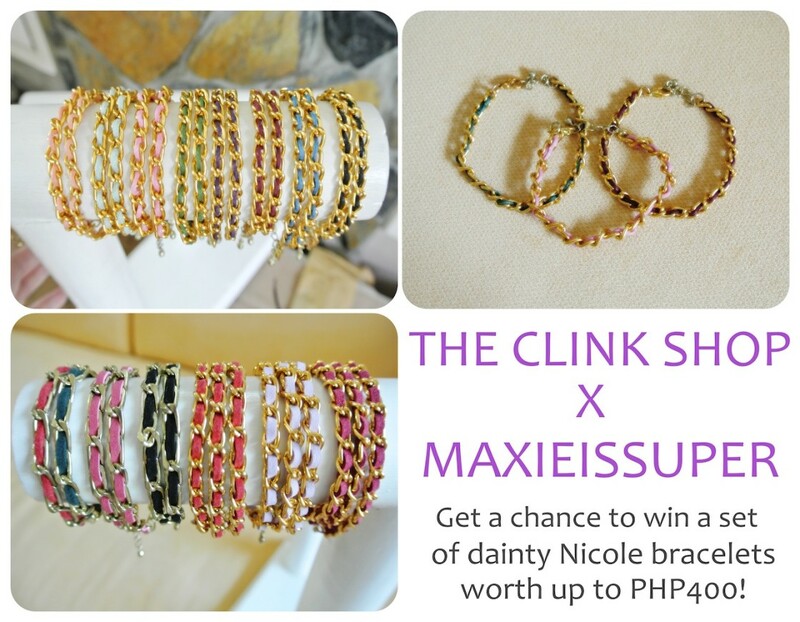 The grand prize will consist of 3 surprise gifts (cosmetics) from Maxieissuper worth up to php1500 and a set of Nicole bracelets from The Clink Shop. The winner who will come in second will win a set of Nicole Bracelets (3 pieces) from the Clink Shop. Like maxieissuper on facebook (https://www.facebook.com/pages/Maxieissuper/405603566153834) and follow maxieissuper on twitter (https://twitter.com/maxieissuper). Like The Clink Shop’s Facebook page (https://www.facebook.com/theclinkshop?fref=ts) and follow the Clink Shop’s Instagram Account (theclinkshop). Post/share the giveaway photo (above) on your facebook wall, or on instagram, and tag 5 friends. (DOING ONE OF THE TWO WILL EARN YOU ONE ENTRY. DOING BOTH WILL EARN YOU TWO ENTRIES) :) Also, mak sure to tag the clink shop on the photo so that we can verify your entries! Leave a comment on this post with your full name, twitter and instagram account on this post. Giveaway ends on April 25, 2013. I am BAACK with my very own website! :) I will still continue to update my old tumblr account at http://maxieissuper.tumblr.com however this website will be my main website from now on. Anyway, what better way to launch my new website, I will be holding my very first giveaway!! 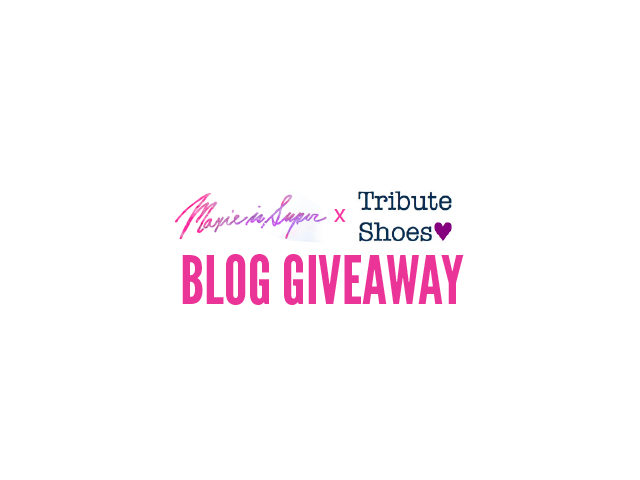 I have always been a fan of Tribute shoes and I have been given a fabulous opportunity to share my love for Tribute Shoes by participating in a blog giveaway! 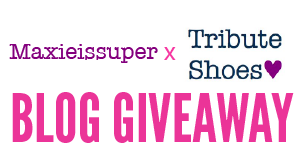 5 winners will be able to take home PHP500 worth of Tribute Shoes products each!! Like Tribute Shoes’ Facebook page (https://www.facebook.com/tributeshoes) and Twitter page (http://www.twitter.com/tributeshoes). Leave a comment on this post with your full name, twitter and answer to this question: “What makes you feel SUPER?” . Certificate is valid only for online purchases. Certificates cannot be used together; Tribute Shoes will only honor one certificate at a time. Certificate cannot be used in conjunction with other promos, sales or discounts. Certificates are transferrable; feel free to share the Tribute Shoes love. All mechanics should be followed to be able to win. Entries with who do not follow all the mechanics are void. The contest is open to Philippine residents only. Deadline for entries is on August 15, 2012 at 11:59pm. 5 winners will be chosen based on their answers and winners will be announced on my Facebook Page and Twitter.